Showing results for tags 'cabbage'. 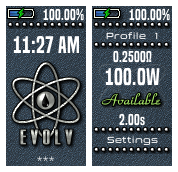 So a close friend of AmbitionZ VapeR told me that his mate had got together with Hellvape and designed a new Atty, and could i make a theme to celebrate it's launch. This is what i came up with. If you're a dripper / Squonker you really should check out this Atty most reviewers are placing it on the same level as the Dead Rabbit and The Drop. 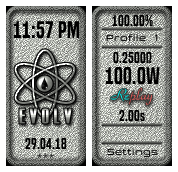 Evolv DNA Theme. Packed in all the features on Escribe that are ( i think ) relevant. Replay screen is an original invention of my own to make it user friendly. see the changeling for updates.